The only comprehensive and authentic guide to some of the best wreck diving in the world. Not only does this book contain classic wrecks such as the Thistlegorm , Carnatic, Giannis D and Dunraven, but it also contains never before published information on the Rosalie Moller, Shillong, Scalaria, Hamada, Hadia, Million Hope, Ayia Vivara ,Atlas, Uylsses TURBO and many more. 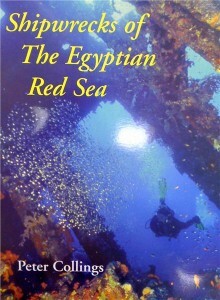 The book puts to rights some of the dis-information surrounding such names as the “Sara H” and the “Chrisoula K” propagated by self proclaimed experts who have some how got their ramblings into print !The author has spent thousands of hours above and below water, enlisting experts ,eye witnesses and survivors testimonies to ensure accurate facts. Diagrams in the first hand add a sense of authenticity and indeed many of the authors own involvement are recounted throughout the book. The book has received world wide critical acclaim from authors historians and divers themselves. IT HAS ALSO RECEIVED THE GOVERNOR GENERALS AWARD FOR EXCELLENCE ! BEWARE OF POOR IMITATIONS CARRYING SIMILAR TITLES!!! NOT £35.00 as quoted in SPORTDIVER!